DOes vma offer other options for education and training? Attend our Valve Basics Exhibits & Seminar in Pasadena, TX, Oct. 30-Nov 1, 2018 at the Houston Area Safety Council. 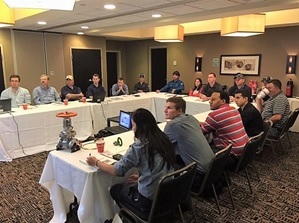 This Valves, Actuators & Controls 101 course is three days long with time allotted for hands-on training (the "Valve Petting Zoo") so attendees can examine many of the products discussed in the seminar. Or, take a look at our Valve Basics Online Training, a 6-credit hour course. Licenses are available for individual usage and group discounts are offered from 5 to 500+ licenses. VMA Certificates of Completion are awarded to all who participate in any of VMA's Valve Ed programs. Professional Development Hours are based on the length of the course. If you have at least 25 employees who need an overview of the products used IN the industrial valve industry, VMA OFFERS AN AFFORDABLE SOLUTION. Experienced personnel are retiring and many newcomers lack basic knowledge about valves and related equipment. Sending numerous staff on out-of-town travel is more expensive than ever. With tightening budgets, it’s hard to find affordable training for your engineers and other employees. VMA can help: If you have 25-plus employees who need training on the fundamentals of valves, actuators and controls, we have the perfect solution for your training needs--a custom valve basics education program. We can modify Valves, Actuators & Controls 101 for your industry – and teach your course either at your facility or at nearby venue… all for less than the cost of the registration fee to attend VMA’s regular course – and with no travel expenses. why A Valve Ed custom training program? You can save a significant amount of money when we come to you vs. you traveling to us! Unlike other off-the-shelf programs, our course is customized to your industry and needs. With so many newcomers in the industry—and those with decades of experience retiring—training has never been more critical. Many manufacturers offer training but VMA’s Valve Ed course is not brand-specific, providing a well-rounded overview of the products used in our industry. Our high-quality educational program is powered by the Valve Manufacturers Association, a not-for-profit organization. VMA is the only association that represents U.S. and Canadian valve, actuator and control manufacturers, as well as suppliers and distributors of these and related flow-control products. Who is eligible to receive custom training? Medium- to large plants and facilities and other users or specifiers of valves, actuators and controls across a wide variety of industries. Member companies of the Valve Manufacturers Association and Valve Repair Council: manufacturers, distributors and suppliers. The topics shown (left column) provide the basic framework for the course. You let us know which topics seem most relevant for your group. Then, members of VMA’s Education & Training Committee will assemble the coursework, adjusting the curriculum so that it best fits your needs. We can teach a one- or two-day course, with topics selected based on what your employees need to learn. For a large refinery with 40 engineers who needed training, we repeated a one-day course so that only half of the group was away from the plant at one time. Most importantly, we can work with you to determine the best structure. Will you have products on display? Samples of selected products are shown to help clarify what is being presented. In addition, we include sufficient breaks so that attendees can examine the products up close and ask questions of our industry experts. Our Valve Ed instructors are members of the Valve Manufacturers Association or Valve Repair Council. They are all experienced practitioners, who know their subject matter inside and out. In addition, our presenters are committed to presenting a program that is educational and that does not promote any one company’s brand. Because there are a number of factors to consider, we will provide a quote based on: 1) Where you are located; 2) the length of the course; 3) the number of people taking the course; and 4) other expenses such as facility rental, catering, etc. Download our informational brochure for additional details and/or contact Abby Brown, VMA education & training coordinator (abrown@vma.org or call 240.328.3866).